When enabling capacity and utilization for metrics gathering over a period of time, it is recommended that the VMDB size scale accordingly. Evaluate the number of instances in your provider inventory and storage duration requirements to plan for increased VMDB sizing requirements. Realtime metrics data are stored for 4 hours. Rollup metrics data are stored for 6 months. Metrics data storage times can be configured by editing the Advanced Settings. The SmartProxy must have visibility into the virtual machines and cloud instances that you want to control. For more information, see SmartProxies in the CloudForms General Configuration guide. The following terms are used throughout the documentation. Review them before proceeding. A computer running a hypervisor, capable of hosting and monitoring virtual machines. Supported hypervisors include RHV-H, VMware ESX hosts, Windows Hyper-V hosts. An external management system that CloudForms integrates in order to collect data and perform operations. A region is the collection of zones that share the same database for reporting and charting. A master region may be added to synchronize multiple VMDBs into one VMDB for higher-level reporting, providing a "single pane of glass" view. 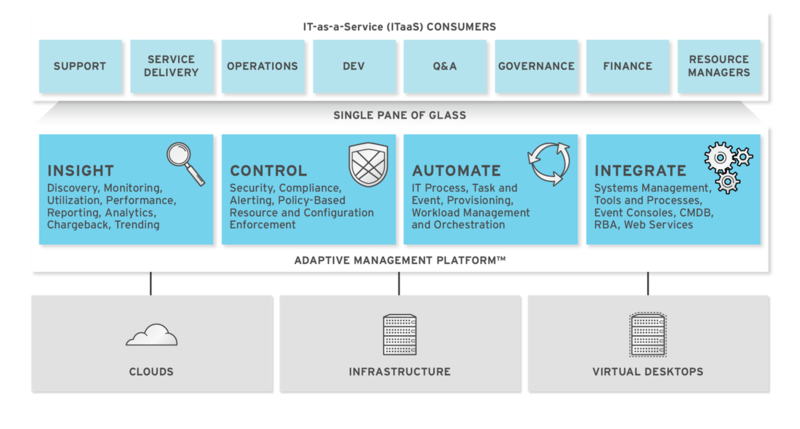 A CloudForms appliance dedicated to a role other than user interface or database. When multiple regions are being used, each with their own unique ID, a master region can be created to centralize the data of all the children regions into a single master database. To do this, configure each child region to replicate its data to the master region database (Red Hat recommends use of region 99, though any number up to three digits will work). This parent and child region is a one-to-many relationship. CloudForms can be configured in a highly available setup. In this case, all PostgreSQL instances must be running on a server that is deployed from the CloudForms appliance. High availability is achieved by database replication between two or more database servers. For more information, see the High Availability Guide. Server roles define what a server can do. Assigning different server roles to appliances can allow them to focus on specific functions. When planning a deployment, consider which roles to assign to each appliance. Some server roles are enabled by default in CloudForms. Many server roles start worker processes. Some roles are also dependent on other roles. For example, because the CloudForms user interface relies on the API for access, the Web Services role must be enabled with the User Interface role for users to log in to the appliance. See Server Roles in General Configuration for details on each server role and its function. Depending on the needs of your environment, you may choose to separate worker and database tasks between appliances. One example of this is to implement a highly available configuration so that certain appliances are running the PostgreSQL database and providing failover. For more details about configuring high availability, see the High Availability Guide. Worker processes are running, and it also hosts its own database that other appliances can connect to. Worker processes are running on the appliance, but it does not host a database. The appliance is connected to an external database. This appliance contains no worker processes, only a database for other appliances to connect to. This appliance contains no worker processes, only a database. As this is not a CloudForms appliance, you cannot run any CloudForms rake tasks on it. This appliance must be migrated using a non-database appliance that is pointed at it, using it as a database. Red Hat CloudForms includes centralized administration capabilities, where certain operations can be initiated from the global region and processed and executed on remote regions. From the global region, you can also access the user interfaces of virtual machines residing in remote regions. CloudForms life cycle operations other than those listed above are not supported. Centralized administration capabilities are not supported from the Self Service user interface. 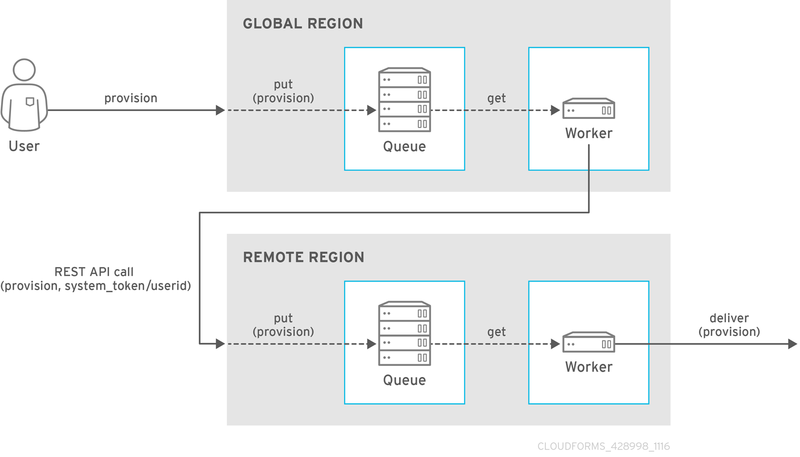 With centralized administration, the remote_queue_put leverages a new system-to-system REST API request to forward the original request to the remote region. This request is put in the local queue in the remote region, which is then delivered by a worker in the remote region as if it was queued there all along. As a result, a CloudForms operator in the global region can be seen as provisioning on behalf of a remote region. The operations initiated from the global region are subject to the role-based access control (RBAC) rules on the remote region. The user in the remote region which matches the logged-in user’s user ID will be used to enforce RBAC in the target region. The operation will fail on the remote system if the user does not have the required permissions. In CloudForms 4.5 and above, configuring database replication automatically enables centralized administration, eliminating the need for further configuration. 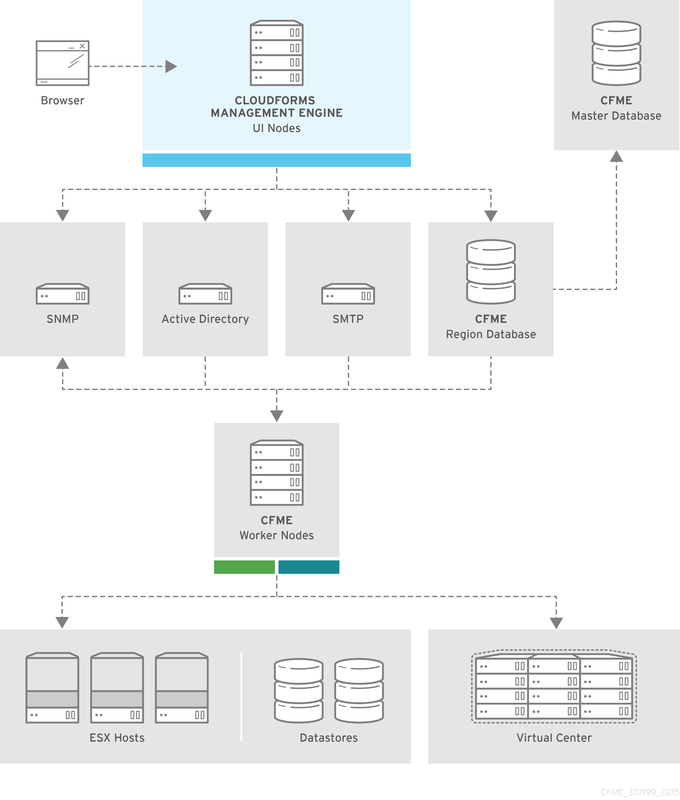 To configure database replication, see Configuring Database Replication and Centralized Administration in the General Configuration guide. Red Hat CloudForms supports multitenancy. Tenants can be totally separate or they can be in a parent-child or peer relationship. Tenants in a relationship can share or inherit a certain configuration. You can subdivide and create child tenants and they, in turn, can have child tenants, and so on. The ability to have multi-level (nested) tenants in a hierarchy enables those at the bottom to inherit permissions from those above. This configuration allows for granular user permissions to be set on specific tenants. A tenant can also contain a self-contained child tenant known as a project. A project cannot have a child tenant, but is useful for allocating resources to a small group or team within a larger organization. If you do not add any additional tenants, all resources and user accounts are contained in a single base tenant which is your CloudForms appliance itself. In CloudForms, is sometimes referred as tenant zero. See Account Roles and Descriptions in the General Configuration guide for more information about these roles. Tenant administrator and tenant quota administrator roles are like administrator and super administrator. These roles are not limited to the tenant upon which they are acting and act across all tenants, and therefore should be considered privileged users. These are not roles inside a tenant. Tenantless - You can create a single large tenant, sometimes referred as tenant zero, and perform all your operations in there without any subdivision of resources or user accounts. Enterprise model - A common scenario is to create a single tenant, and then subdivide it based on the structures or departments within your organization. Those departments are then able to further subdivide their resources into distinct projects. With this model, you have a single URL for user access, while still having the ability to divide resources into nested hierarchical tenants. You can create and configure tenancy using the CloudForms user interface in the same place you set up users, groups and roles by selecting Configuration from the settings menu, and then clicking on the Access Control accordion. See the section on Access Control in the General Configuration guide for procedures on how to create tenants and projects, users, and groups. Just like standard domains are nested, you can also add automate domains that are nested at the tenant level. For the procedure on how to create a new automate domain, see Scripting Actions in CloudForms. See the section on Managing Tenant and Project Quotas in the General Configuration guide for procedures on how to create and manage quotas. You can generate or schedule a report for Tenant Quotas similar to other reports. See Reports in the Monitoring, Alerts, and Reporting guide for procedures on how to view or schedule a report. Currently, in tenant quota reports you will see all of the tenants but there is no nesting information available by parent and child tenants. In the following example of a tenant quota report, DevOps Teams is a parent tenant and Team Alpha and Team Bravo are child tenants. You have the ability to do tenancy in chargeback where you are able to assign rates and have a different rate for each tenant. You can make use of the default rate or create your own set of rates depending on the tenant. As well, there is an ability to create chargeback reports by tenant. See Chargeback in the Monitoring Alerts, and Reporting guide for information on how to create and assign default or custom chargeback rates, and how CloudForms calculates chargeback costs. Similar to automate domains, you can have service catalogs at each level of tenancy. Once you add a service catalog at a particular level of tenancy, it is visible to that tenant and its children (unless you use tagging to exclude). Providers can be added at any level of tenancy. Once added, a provider is visible to any child or lower tenants, making it possible to easily separate resources that are owned or accessed by one group, and should not be available to other tenants. Deploying multiple user interface worker appliances and placing them behind a third-party load balancer allows for redundancy and improved performance. This requires extra configuration in both the load balancer and in the CloudForms user interface worker appliances. Configure the load balancer to use sticky sessions. This ensures that when a session is started, all requests for that session are sent to the same worker appliance. Configure the load balancer to test for connectivity using the CloudForms ping response page: https://appliance_name/ping. The expected reply from the appliance is the text string pong. Using this URL is preferable to the appliance login URL as it does not establish a connection to the database. When using a load balancer, configure appliances that have the User Interface role enabled to store session data in the database. As a result, the user does not need to re-login if the load balancer redirects them to an alternative server in the case the original user interface worker is unresponsive. Configure the session_store parameter to point to sql on each user interface appliance behind the load balancer. See Advanced Settings in General Configuration for more information on editing configuration files from the appliance user interface. Also see Load Balancers in the Deploying CloudForms at Scale reference architecture for further information. 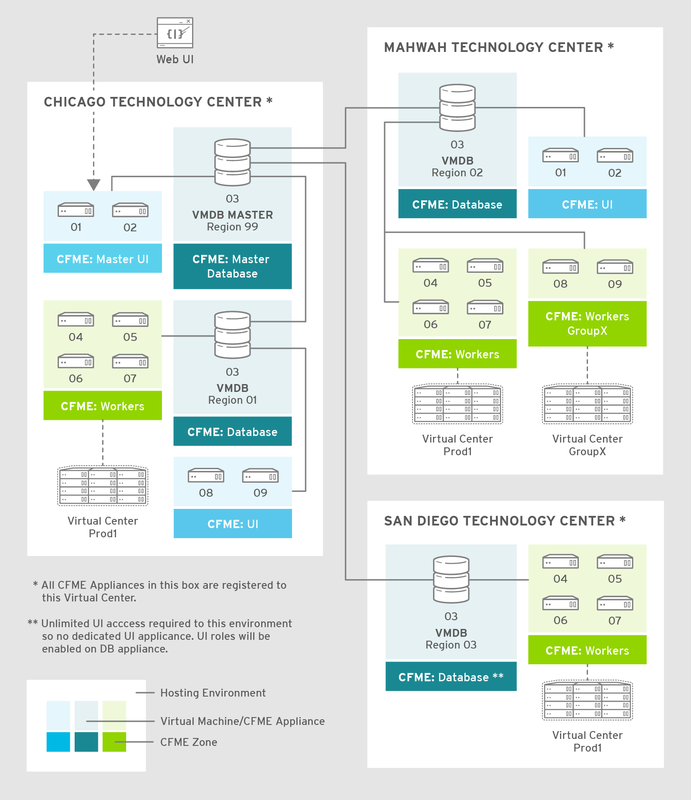 For information on configuring database failover in VMDB appliances, see the High Availability Guide. This section describes the Red Hat CloudForms PostgreSQL database configuration. The below table provides information on each file: its location, primary function, and notes regarding behavior or recommendations. Store custom configurations, or user overrides, in /etc/manageiq/postgresql.conf.d. Name the user override file so that it follows 01_miq_overrides.conf alphabetically. This ensures custom configurations are not overwritten on CloudForms upgrades. Query the CloudForms PostgreSQL database directly to read configuration settings. See the PostgreSQL Documentation for more information. The Capacity & Utilization Coordinator role checks to see if it is time to collect data, somewhat like a scheduler. If it is time, a job is queued for the Capacity & Utilization Data Collector. The Coordinator role is required to complete capacity and utilization data collection. If more than one server in a specific zone has this role, only one will be active at a time. From the settings menu, select Configuration, then select the server to configure from Settings → Zone in the accordion menu on the left. Data collection is enabled immediately. However, the first collection begins 5 minutes after the server is started, and every 10 minutes after that. Therefore, the longest the collection takes after enabling the Capacity & Utilization Collector role is 10 minutes. The first collection from a particular provider may take a few minutes since Red Hat CloudForms is gathering data points going one month back in time. 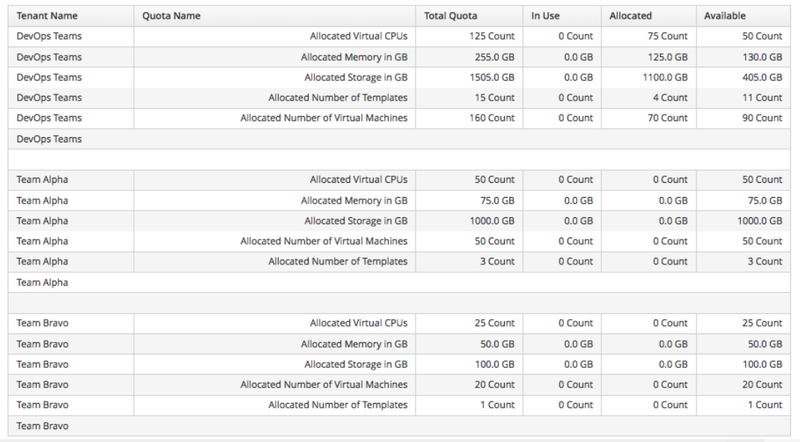 In addition to setting the server role, you must also select which clusters and datastores to collect data for. For more information, see the General Configuration guide. You must have super administrator rights to edit these settings. To collect capacity and utilization data for Red Hat Virtualization (RHV), you must add a user to the RHV-M history database for Red Hat CloudForms to use. Perform this procedure on the PostgreSQL server where the history database (ovirt_engine_history) is located. Usually, this is the RHV-M server. $ psql -U postgres -c "GRANT CONNECT ON DATABASE ovirt_engine_history TO cfme;"
Enable PostgreSQL to listen for remote connections. Capacity and utilization charts for host, clusters, virtual machines, and datastore provides its own set of special features including zooming in on a chart and shortcut menus. For information about utilization trends and identifying bottlenecks in your environment, see Data Optimization in Managing Infrastructure and Inventory.